From a leading voice in health, nutrition, and fat-cell research comes a radical and revolutionary approach to losing weight, looking great, and achieving optimum health—simply by restoring your body's fat cells to their natural state. According to Dr. Lori Shemek, a successful diet isn't centered on calories or cardio. She says, "Cutting calories doesn't cut it." Our problems with fat are created because we eat foods that cause the body's natural fat cells to become inflamed. Sadly, the staples of the Standard American Diet—from pasta and bread to factory-farmed chicken and cattle, from sugar and artificial sweeteners to salad dressing and soft drinks—irritate our fat cells, causing chronic inflammation and chronically oversized fat cells. This irritation causes the body to store fat permanently, no matter how hard you exercise or how diligently you cut back on calories. Dr. Shemek calls this serious condition FATflammation, and only when you decrease the inflammation of the fat cells can you achieve the weight loss and optimum health you've been chasing. We need to forget about counting calories, counting points, fad diets, no-fat diets, and spending countless hours at the gym. There is a better and more satisfying way to lose the fat and maintain your desired weight. 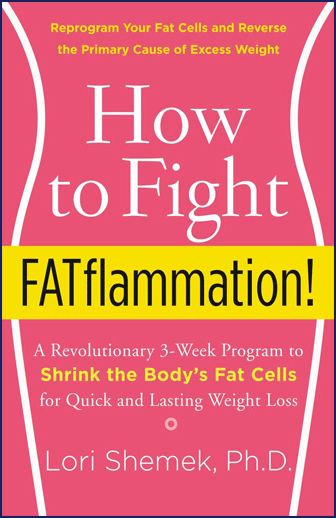 "If we want to fix our problems with fat," Shemek writes, "we need to reduce the inflammation in our fat cells." In How to Fight FATflammation Shemek reveals her revolutionary three-week program that helps reboot your body chemistry by returning your body's fat cells back to their natural, healthy state. In the process, she explains the critical importance of maintaining balance between good fats (omega-3) and bad fats (omega-6) and how a proper ratio of both will help boost your metabolism; in short, your body will burn fat simply by your eating the right kinds of fat. She also helps you eliminate from your diet the dreaded FATflammation Four—sugar, refined grains, high-fructose corn syrup, and artificial sweeteners. Here's your chance to shrink your fat cells and get the body you always wanted.